Any one of several Christmas songs. I love them. And I love singing along with them. Nerd alert! And . . . um. . . that GMC book. Seriously? Jon Snow from Game of Thrones (Kit Harington). But I wouldn’t kick any of the above out of bed for eating crackers! Romance and fantasy. Romance covers a number of sub-genres: Contemporary, Paranormal, Suspense, Rom Com. Also Young Adult. I guess what that says about me, along with my fairly diversified list at BelleBooks/Bell Bridge, is that I like a good genre or commercial fiction story. The one where I had to leave before the very late/delayed headline band came on because I had a curfew. First date. It’s a wonder my husband still married me. Murder scenes. My parents could read those. The ability to pretend that things you put on the calendar for “later” still have to be done SOON. That always gets me in trouble. I’d rather stream a TV season WHILE eating s’mores on my couch, but the husband loves a good road trip. And he drives, so I’d probably love a leaf tour, too. Personal empowerment. Finding life’s purpose and staking a flag to claim your life for yourself regardless of the possibility of failure. When I wrote my first romantic suspense—almost on a whim, I had so much to learn. For the first time in my career, I got major revisions from an editor. Her first words to me were, “I’m disappointed.” I had to pull the book apart, throw out 20,000 words of plot and resurrect the book. Then I had to do a second edit, which I’d never had to do before. But. . .the book was so much better. (award winning better) I had some serious trepidation about writing another book, but my husband said, “How much worse could it be?” True. I realized I’d been through the fire. I had the skills. So, I dug in and tackled the next idea. It would have a chocolate fountain, and come with a pool boy and a full-time maid. I am a mad quilter. It’s ridiculous. I have a purpose built room and a full closet in another room to house this insane hobby. I just hosted a quilting retreat at my house, and my husband is so awesome at taking care of us and feeding us, that someone left money in the refrigerator and silverware drawer to be sure he’d invite the crew back. Why does Richard Kimball of The Fugitive want to find the man who killed his wife? Because he wants to clear his name. Because he wants justice for his wife. Because he doesn’t want to spend the rest of his life in jail. One of these motivations is urgent. All are compelling. Together these motivations are strong enough for us to believe each and every action Kimball takes in the movie. He is focused on one goal, pushed toward it by motivations that won’t let him quit. This is of course external motivation. It relates to the concrete external goal of Kimball, which is to find the man who killed his wife. This particular movie is tightly constructed. The internal motivation also feeds the external GMC. As I mentioned previously, we are left to piece together Kimball’s internal GMC. Therefore, I’m listing a couple of motivations which suggest themselves in the movie. Neither is fully-developed, but they are strongly hinted. Why does he want to free himself from the guilt? Because he is haunted by visions of his failure. He has nightmares and waking-mares that remind him of every detail of the killing. Because he’ll never be able to go forward until he puts the past behind him. As in Dorothy’s example, the internal motivation is something that creates emotion. Writers of romance novels should give the internal elements of GMC particular attention since romance novels are well-known for having an external story and an interior story. “Wounded heroes” can usually be understood by studying their internal GMC. In fact internal GMC is the best weapon a romance writer has for making the popular alpha male hero—the strong silent type—accessible to the reader. If you want the reader to fall in love with Rhett Butler, then the reader had better understand what makes the man tick. If we know what’s important to him, we sympathize with him. The Fugitive offers a good example of secondary character motivations. Deputy Marshal Gerard is like a dog with a bone. Why does he want to capture Richard Kimball? Because he believes felons are dangerous. Because it is his duty to protect the citizens of the U.S.
Because his reputation is on the line. Gerard’s multiple external character motivations for this one goal are important. Through the course of the investigation Gerard will learn that Kimball is not dangerous. The man hasn’t harmed a flea. Hasn’t committed any crimes that injure people. He’s even put himself at risk to save a young boy misdiagnosed in an emergency room. All his actions form the portrait of an innocent man trying to clear his name. This felon isn’t dangerous. Therefore one of Gerard’s motivations is weakened. Fortunately, Gerard has two other motivations to draw on, two more that push him forward with the same determination as before. In fact, Kimball’s escape during the jail scene is a personal prick to Gerard’s ego. Gerard had Kimball in his sights, and Kimball still got away. As one motivation weakens (Kimball is not dangerous) another motivation (Gerard’s reputation) is strengthened. When using multiple motivations, be cognizant of the ways they can work to keep your character on task. 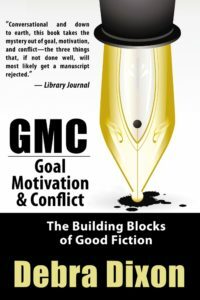 GMC: GOAL, MOTIVATION & CONFLICT, a release from Gryphon Books for Writers and a widely acclaimed text for writers, may be purchased through these retailers: Amazon, Kobo, Barnes & Noble, Google and Apple. Debra Dixon is the President and Publisher of BelleBooks and its imprints—Bell Bridge Books and ImaJinn Books, which tackle a broad spectrum of genres. Their titles have been picked up in translation and by major publishers in sub-rights deals for mass market paperback, book club, audio and large print. 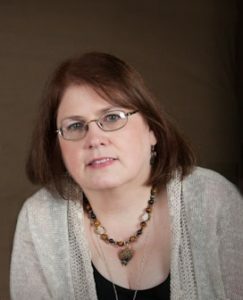 The company has published original work from NYT and USA Today bestselling authors and is delighted to be publishing the new Diana Pharaoh Francis urban fantasy series which has consistently received Top Picks and 4.5 stars from RT Magazine. Early in her career, Debra published with major publishers, wrote ten books, contributed to twelve anthologies, and served as Vice President of Romance Writers of America. Her popular GMC: Goal, Motivation, and Conflict workshop spawned a book that has become a how-to bible for writers. I love this woman and she’s as charming as she says. I have her GMC book on my shelf and along with her presentation at a conference I attended on the hero’s journey they are always on my mind as I put a book together or create a new character I want my readers to love and become attached to. GMC is a “must” when I start/plot/brainstorm a new story and characters. Just. Get. It. And if you have a chance to go to a workshop given by Debra—go!